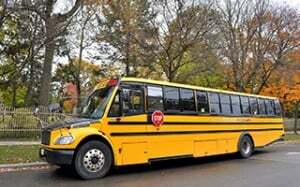 *When it comes to your child’s safety before getting on or getting off the school bus, there is simply no substitute for adult supervision. If you, or perhaps another parent in the area, can take the children to the bus stop, do it! If you can meet your children right at the school bus stop, do it! You’ll really appreciate knowing that your child is being supervised, and is protected from hazards such as crossing a busy street alone. A listed designate must meet JK/SK & some special needs students at their stop. Please be at their stop at least 5 minutes prior to it’s scheduled arrival time. Be consistent as this helps the driver keep your child safe. Your child must be met where the bus stops – NOT by waiting in a vehicle or standing in a doorway. Take your child by the hand and lead them away from the school bus danger zones. Please be proactive and take the time to educate and review these rules for safe school bus riding! Hold bags and parcels in your lap. Do not stick your feet in the isle: someone might trip. Keep your head and arms everything inside the bus. Don’t throw anything out the windows or around in the bus. Save snacks for snack time at school or until you get home. They may spill or you may choke if the bus goes over a big bump. Always follow the bus drivers instructions. *Properly register all your children to ride the bus. Don’t just simply send your child(JK) to a bus stop with an older sibling to catch a bus. *keep your school updated of any changes to your address and phone numbers, even if you are staying at the same school. *a riders stop means at the side of the road (clearly visible) Rain or Shine. Not inside the garage, etc. *Have a plan – even if you plan to meet your kids at the stop every day, talk to them about what to do if you are running late one afternoon. i.e. a hidden key, go to a neighbour’s house, etc. *Try not to overload your child with an oversized/overloaded backpack. This makes getting on and off the school bus more hazardous.